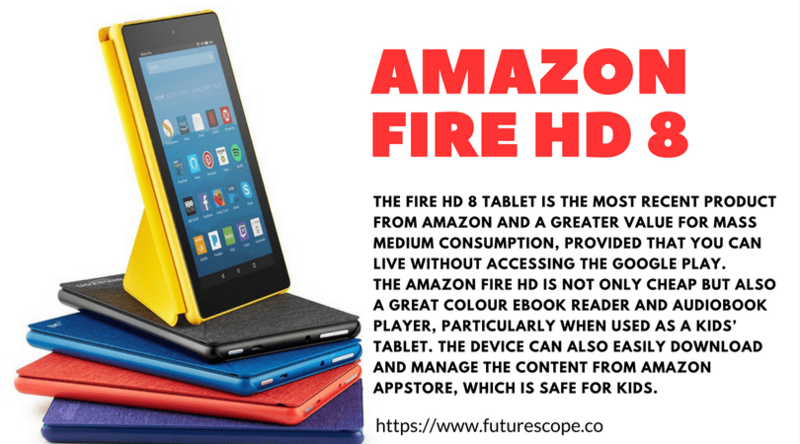 The New Kindle Fire HD 8 tablet is the most recent product from Amazon and a greater value for mass medium consumption, provided that you can live without accessing the Google Play. The device delivers faster performance, a larger battery and more storage than most of the previous versions for a lower price. It boasts a brighter 8-inch screen while its speakers are louder. If you need to store more files, you will highly benefit from the expandable microSD storage and the ample parental controls. And if you are an Amazon Prime member, be ready to access bucketloads of free music, video and some other content after subscribing. Take advantage of what the product has to offer today. The $79.99 Amazon Fire HD 8 (16GB) is probably among the best sub-$100 tablets available in the market. With stronger Wi-Fi, lower price and better audio, the device takes the crown away from the less-expensive sibling (the $49.99 Fire 7). Even though you should not expect to start competing with iPad at the price point, the device is ideal for individuals who enjoy light gaming. The following are some of the features that will help you identify the product. The plastic-shelled Amazon New Kindle Fire HD 8 is available in blue, black, yellow and red colours. It measures 5.0×8.4×0.4 inches and 13 ounces. The decent size makes it easier to hold the device on your hand as your ebook reader, but it is somehow heavier for marathon reading sessions. When buying the product, remember that it is not formally water-resistant or ruggedized. However, its plastic shell withstands average knocks and drops. The product’s 1,80×800 LCD screen has 189 pixels per every inch and is not the brightest. The Amazon’s Fire 7 is smaller but is brighter and less dense at 1771ppi. The display appears to be yellowish while that of the Fire 7 is potently blue – neither of the two is evenly white. The extra pixels will make a huge difference particularly when reading online magazines and comics. However, Amazon is not sure whether we should use the tablet in landscape or portrait mode. It boasts dual stereo speakers at the bottom in landscape mode, but on the left side when in portrait mode. The front-facing VGA camera remains on top when the device is in portrait mode but on the left hand side when the device is on landscape mode. Also, the volume buttons, the headphone jack, the micro USB port for syncing with PCs and port for charging will remain on the top edge when the product is in portrait mode. 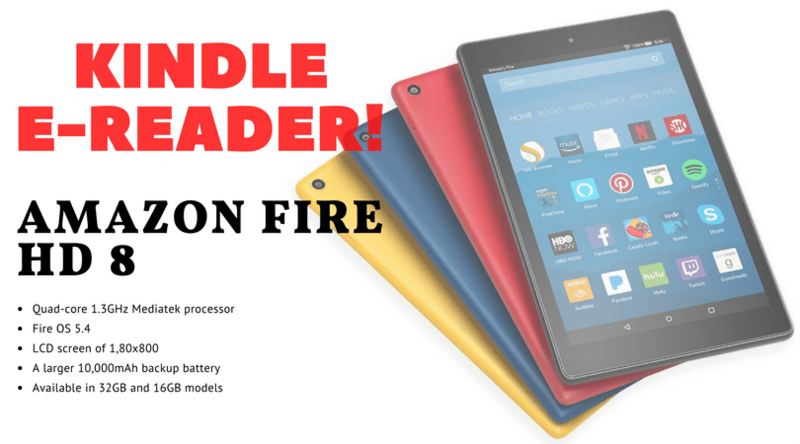 The New Kindle Fire HD 8 features the quad-core 1.3GHz Mediatek processor, available with the Fire 7 and the Fire OS 5.4 software, which is based on the Android 5.1. However, the Kindle Amazon Fire HD 8 has a better performance considering that the manufacturer included 1.5 GB of RAM, while the HD Fire 7 had 1GB of RAM. Therefore, the user interface icons render faster, the apps are less likely to crash and the web benchmarks have a higher score. The device will definitely provide you with a better experience. Did you know that dual-band Wi-Fi is now common on the affordable tablets? Yes, that is a great thing. The device’s 5 GHz Wi-Fi is faster than that of the Fire 7, probably due to the large difference in RAM. The speed is almost double that of the Fire 7. That makes a huge difference particularly when downloading movies or comics. Even more, the battery stands at 4 hours and 42 minutes during web video streaming at the maximum screen brightness. You will enjoy a longer battery life during mixed usage, mainly because the Amazon’s Silk web browser consumes a large part of the battery power. A good option is to invest in a larger 10,000mAh backup battery. The Amazon Fire tablet is Android compatible, but works well as an Amazon media consumption device. You can easily change it into a general purpose Android slate, but the Amazon restrictions are a blessing in disguise – they prevent users from getting frustrated with the inexpensive tech. The manufacturer derived the OS from Android and it can therefore run any Android app, but the user interface is different from that of Android devices. If you are an enthusiast of Amazon, the device offers many features that you will definitely like. Its interface is clearer and simpler than that of many Android tablets in the market. The bold words will prove beneficial when accessing videos, books, games, audiobooks and music. The device automatically syncs and loads the Amazon content library from time to time. Also, all pages try to sell something. The manufacturer supplies the device with its navigation, email apps and document reader supporting the common formats and services. To download more apps, the Amazon New Kindle Fire HD 8 defaults to Amazon Appstore. You still download other Android apps in APK format using your PC or microSD card and transfer them to the device. All Google apps including YouTube are absent. The product is available in 32GB and 16GB models – the 32GB model has a price tag of $30. The 16GB model has 12.24GB free memory. You can also use the micro SD memory card slot to expand the capacity. Even more, the dual speakers are a bigger positive surprise. A large number of the affordable tablets in the market (including the Fire 7) have one tinny speaker. On the other hand, the two bottom-mounted speakers on the Fire 8 provide a true stereo sound in the landscape mode. The audio is typically larger and better-defined than that of similar priced tablets in the market. The video playback is not the best because the screen is slightly dim. Videos sound better and play smoothly. However, you will have trouble making out the dark scenes particularly in bright rooms. The Amazon Fire HD is not only cheap but also a great colour ebook reader and audiobook player, particularly when used as a kids’ tablet. The device can also easily download and manage the content from Amazon Appstore, which is safe for kids.